Adolf Hitler was an evolutionary racist. Evolutionary racism refers to a racist philosophy based on Charles Darwin's evolutionary theory. It assumes that men have continually evolved, and thus some races are more evolved than others. It replaces Christian morality with the atheistic "survival of the fittest." An example of evolutionary racism is when an evolutionary racist put Ota Benga on display at the Bronx Zoo in the monkey house. Evolution establishes a "scientific" rationale for racism by extending the "great chain of being" to humanity. Just as animal species are ordered into a hierarchy according development, so too the "races of men" are described as being more or less developed than others. Evolutionists then extend the doctrine of survival of the fittest to humanity. Removing religious morality and replacing it with the laws of nature, they claim that just as the varieties of animals struggle to survive, so shall the varieties of man, with the strong dominating and destroying the weak. Social Darwinism and evolutionary racism allowed "human zoos" to proliferate in the late 1800s, wherein a supposed evolutionary progression of humans - from apes, to Africans, to West Europeans - were placed in a line. African and other tribal populations were routinely described as more akin to savage primates than Europeans. Darwin's evolutionary racism would have enormous impact in early 20th century, eventually leading to eugenics programs (first devised by Darwin's cousin Francis Galton) in American and Europe, and also influencing Adolf Hitler. Dr. Robert E.D. Clark wrote in his work Darwin, Before and After the following regarding Hitler and the theory of evolution: “Adolf Hitler’s mind was captivated by evolutionary teaching — probably since the time he was a boy. 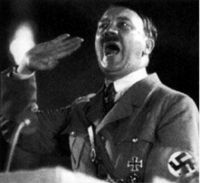 Evolutionary ideas — quite undisguised — lie at the basis of all that is worst in Mein Kampf — and in his public speeches”. Richard Dawkins is a prominent evolutionist. Richard Dawkins stated in an interview: “What’s to prevent us from saying Hitler wasn’t right? I mean, that is a genuinely difficult question." Noted evolutionary anthropologist Sir Arthur Keith conceded the following in regards to Hitler: “The German Fuhrer, as I have consistently maintained, is an evolutionist; he has consciously sought to make the practices of Germany conform to the theory of evolution”. “ While it is true that persecution of the Jews has a very long history in Europe, it is also true that science in the twentieth century revived and absolutized persecution by giving it a fresh rationale — Jewishness was not religious or cultural, but genetic. Therefore no appeal could be made against the brute fact of a Jewish grandparent. [Richard] Dawkins deals with all this in one sentence. Hitler did his evil "in the name of ... an insane and unscientific eugenics theory." But eugenics is science as surely as totemism is religion. That either is in error is beside the point. Science quite appropriately acknowledges that error should be assumed, and at best it proceeds by a continuous process of criticism meant to isolate and identify error. So bad science is still science in more or less the same sense that bad religion is still religion. That both of them can do damage on a huge scale is clear. The prestige of both is a great part of the problem, and in the modern period the credibility of anything called science is enormous. As the history of eugenics proves, science at the highest levels is no reliable corrective to the influence of cultural prejudice but is in fact profoundly vulnerable to it. There is indeed historical precedent in the Spanish Inquisition for the notion of hereditary Judaism. But the fact that the worst religious thought of the sixteenth century can be likened to the worst scientific thought of the twentieth century hardly redounds to the credit of science. Evolutionist and new atheist Richard Dawkins stated in an interview: “What’s to prevent us from saying Hitler wasn’t right? I mean, that is a genuinely difficult question." The interviewer wrote, regarding the Hitler comment, "I was stupefied. He had readily conceded that his own philosophical position did not offer a rational basis for moral judgments. His intellectual honesty was refreshing, if somewhat disturbing on this point." Josef Mengele (1911 - 1979) was a German physician and researcher who perpetrated the Holocaust in the Auschwitz death camp. Mengele had obtained a Ph.D. based on the study of racial differences in the anatomy of the jaw. He was one of the greatest supporters of Nazi theories of racial superiority with questionable research claims. Dr. Josef Mengele's evolutionary thinking was in accordance with social Darwinist theories that Adolph Hitler and a number of German academics found appealing. Mengele studied under the leading proponents the "unworthy life" branch of evolutionary thought. Mengele strongly supported the murder of the physically and mentally disabled. Dr. Mengele was one of the most notorious individuals associated with Nazi death camps and the Holocaust. Dr. Mengele obtained an infamous reputation due to his experiments on twins while at Auschwitz-Birkenau. He was known as the "Angel of Death." He performed experiments on humans in the concentration camps attempting to prove that disease was the product of racial inferiority and in order to genetically engineer a new species, which was the aim of his organization, the Frankfurt-based Institute of Hereditary Biology and Racial Hygiene. He amputated healthy limbs and performed other unusual operations on prisoners. While the concept of "race" has since been proven by biology to be nonsense, Evolutionary Racism remains very strong amongst bigoted white supremacist groups, who continue to see race in evolutionary terms and believe in the superior advancement of western "races". —Ken Ham, Evolution: The Lie (1987), p. 86. In addition, evolutionary racism was directed at Michelle Obama. This page was last modified on 9 April 2019, at 06:57.